Pennsylvania is home to two great east coast cities: Philadelphia and Pittsburgh. Pennsylvania, also known as the Keystone state, is a beautiful, scenic state. If you’ve never been, you should try it sometime. Maybe even go to school there. 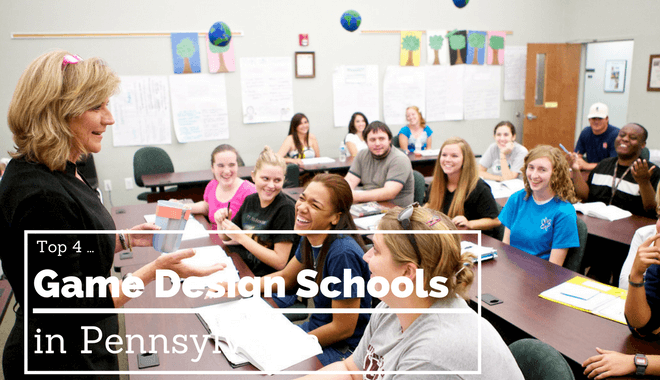 Speaking of going to school in Pennsylvania, we put together a list of schools that have solid game design programs! Our methodology includes a few different ranking factors: Faculty caliber, alumni satisfaction, employment after graduation, and strength of the program. For now, worthwhile game design programs are few and far between. You’ll notice that this list, along with our other game design school lists, are short. That’s allowed us to go more in-depth on what you can expect. The numbers do not denote any kind of rank, they are there for article clarity. The crux of the game design program at Carnegie Mellon is the idea of collaboration. The idea is that, through the game design courses, you as the student will learn how to bring your specialized knowledge to bear. Your “specialized knowledge” in this case, is the knowledge you learn through your Major area of study. Both the minor and the concentration tracks at Carnegie Mellon will require heavy interdisciplinary collaboration. If you’re looking for a program that requires this high level of collaboration and constant interaction, the undergraduate Game Design program at Carnegie Mellon could be the strong choice for you. While both the minor and concentration are run through the Integrative Design, Arts & Technology Network, certain game design classes come from other departments at Carnegie Mellon University. Game Design, Prototyping, and Production is offered by the Entertainment Technology department. While Character Rigging for Production, for example, is offered by the Art department. Computer Game Programming is offered by the Computer Science department, and a course like Design of Education Games is offered by the Human Computer Interaction department. This kind of cross-discipline method to offering courses fosters that team diversity and collaboration that Carnegie Mellon University is working hard to cultivate. And, of course, to make it all happen–you might want to take Team Communication, offered by the English department, in order to learn how to create effective teams. You won’t be able to enroll in a minor or concentration until either your sophomore or junior year. To do so, you’re required to enroll in what Carnegie Mellon University refers to as a “portal course.” There are two portal courses to pick from. The first is Intro to Computing for Creative Practice which is geared towards Arts and Humanities students. It’s tailored toward students with no prior programming experience. The other portal course option is Introduction to Media Synthesis and Analysis, which is geared towards Engineering and Computer Science students. It’s tailored toward students with little experience in content analysis and authoring. Lots to think about. If you’re decided between Game Design and another major, Carnegie Mellon University might be the answer you seek… You could get your major in that other area of study, and actually incorporate it into your video game minor studies. It’s also worth noting that Carnegie Mellon University is based in Pittsburgh, the western PA city. Drexel University is based in Philadelphia, the eastern PA city. It’s another University where the game development program doesn’t exist in a single department. The reason for this taps into the idea that game development in commercial settings is a diverse practice. So be prepared for interdisciplinary collaboration. Drexel University boasts some impressive accolades that should make your ears perk up and your eyebrows raise. Drexel University students have taken 1st place at the Intel Student Showcase featured as part of the Game Developer Conference. Drexel University students have also taken 1st place in the Microsoft Imagine Cup. They took 1st place overall, meaning they were, in fact, the world champions at one point. Drexel U students have also won Unity Awards, the Narrative Review Competition also hosted by the Game Developer Conference, and they were world champion in the Adobe Achievement Awards. Drexel University, it seems, is not afraid to thrust its students into the crucible, only to have them come out minted in gold on the other side. The co-ops and interns from Drexel that try their hand at Microsoft have one of the highest full-time job offer rates of any university that sends students to the giant company. If you take a look at their alumni guest speaker list, you’ll see that pattern. One alum now works at Disney, three work at either Microsoft Studios, Microsoft XBOX, or Microsoft Game Studios. They have two other alumni guest speakers listed, one who works at Firaxis games and one who holds the Cinematic Lead position at NCSoft’s Carbine Studios. If you like Microsoft, you should definitely give Drexel University a look. But even if you don’t like Microsoft, opportunities at Drexel U seem to abound. The Lehigh Carbon Community College is a highly affordable option, even as far as community colleges go. It also boasts solid two year programs in both the Digital Arts and Programming tracks. You’ll learn all about user experiences in video games, across 2D and 3D game engines. You’ll work with your peers in teams, which will help you further develop your project management skills. You’ll learn to render 3D models and textures efficiently and effectively. You’ll be able to create visual assets for use in simulation projects, or video game projects.. If you’re looking for a good two-year stepping stone at a very affordable cost, check out LCCC. Upon graduation, you will be equipped to pursue entry-level positions in the gaming industry, design your own games and simulations, or pursue further education. The Art Institute actually has three locations spread around Pennsylvania. We’ve chosen to focus on the Philadelphia location, but there’s one in York, PA, as well as Pittsburgh, PA. Faculty and course offerings will vary slightly based on location and availability–each location will obviously have different instructors and as a result, classes might be slightly different. Even so, the core mission behind the Art Institutes remains the same, no matter how many miles separate the campuses! The Art Institute’s pitch is less about the collaborative environment you’ll face professionally, and more about making sure you have the chops to get things done. Just because there are several Art Institutes (this is a national thing, not just a PA thing, you might’ve seen them on our other school lists), does not mean the degree is less challenging or less meaningful. So there you have it… If you want a challenge, try the Art Institute. The degree has 180 Quarter Credit Hours, and a timeframe of 12 quarters. Plus, you have some flexibility when it comes to location– within the state of Pennsylvania and even on a national scale.